Steve was one of the few who backed Nicklas Bendtner’s camapign for ridiculous headgear. There quite a few bits of delicious information floating around today. Lazio’s Brazilian starlet, Hernanes, a player often linked with Arsenal, has had his agent speaking out about his future. He’s got a contract until 2015, his family are settled in Rome, and there’s no reason for him to leave. Pity, as he does represent the type of attack-minded, full-of-guile, midiflder I think we’ve lacked on occasion. “About Arsenal, I can tell you the same as before. Only Arsenal and Real Madrid have contacted us and now we are waiting. “I have a contract with Anderlecht until 2015 but the club know what I want. My intention is to leave. “We have negotiated my buy-out clause and, if a club comes and pays the clause, Anderlecht will allow me to leave. Interesting. With the deal for M’Vila frustratingly yes-no, yes-no, there might just be a surprise looming. I’ve got limited knowledge of Biglia as a player, so whether he’d be a good option or not is something I wouldn’t care to comment on. I still think M’Vila is far the more likely, but there’s never any harm is keeping your options open. That’s all wildly speculative. What’s cast in iron is the departure of Arsenal stalwart, and Arsene’s No2, Pat Rice. 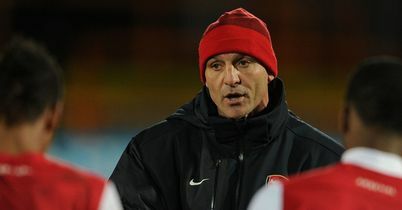 He’ll be taking a richly deserved retirement, and his position will be filled by another defensive great, Steve Bould. Personally, I think it’s a superb appointment. Bould commands respect from the players with his service to Arsenal, and has already proven himself a more than capable coach in other areas of the club. Pat Rice will be missed after years of commitment and service, but I think we’ve acted smartly in filling the vacancy he’ll leave. Like all of you, I wish Pat all the best for the future, and thank him for the enormous good work he’s done over the years. “Lukas is very confident. When he feels he has to be there for the team and when we needed a goal he was always there. “He was always one of the best players on the pitch and nothing could take him down. He is so confident and that is what I like. He is a fantastic striker. “Everywhere he has played he has scored a lot of goals. I’m really starting to look forward to him contributing to the team next season. He’s at the right age – 27 – and he has bags of experience. I can see him being a success at Arsenal if he can hit the ground running. Lastly today, I’m going to point you in the direction of my latest column for Arsenal Vision. The owner of that website, the individual crazy enough to ask me to contribute on a regular basis, today informed me that my column topped the popular list on News Now. It amassed somewhere in the region of 21,000 hits. Granted, this is nothing short of shamless boasting on my part, but I’m proud of that fact and wanted to share it with you all. There’s no shame in a little bragging between friends, is there? You can have a read here. I hope you enjoy it. cheers on the NN crown! I enjoy your articles, you don’t speculate on things foreign to you….remember, your just as beautiful as we are! TO LET YOU KNOW, MANY FROM THE STATES EVEN READ YOUR THOUGHTS! THEY SEND YOU SUNSHINE! A bit of sunshine sent my way is always appreciated.